There's a decent amount we can predict about President Obama's last State of the Union address. Some of what's planned for the Tuesday speech has been hinted at by the President himself, and it looks like he's thinking "big picture" for the evening. Other topics his White House staff has announced as high up on the 2016 agenda, and so will likely get a reference or two in the address. But there's always room for surprises, and with this being Obama's final SOTU, he may decide to go all out. 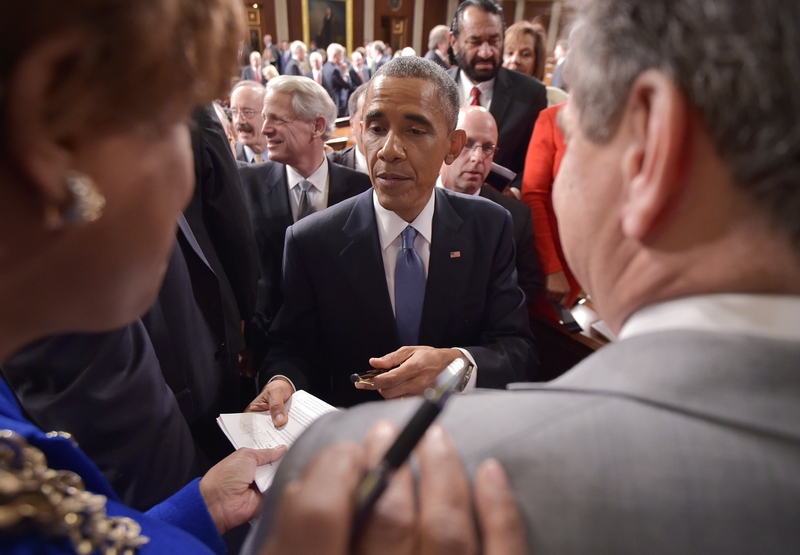 So what's the most ambitious thing Obama could propose at his last State of the Union speech? Obama could do what's needed to be done for years now, and announce a plan to do a major overhaul of American infrastructure: roads, bridges, ports, rail, you name it. That's right. Picture bridges that aren't structurally deficient and public transit buses that don't break down. And the best part about the proposal – the one that would get millions of Americans onboard immediately — is all the jobs that would be created as a result. Sure, it's not criminal justice reform or healthcare, but that doesn't mean Obama doesn't care about improving our country's generally outdated framework. The president has been a quietly faithful supporter of infrastructure projects throughout his presidency. While the national infrastructure's report card grade increased in the 15 years leading up to 2013, it moved up from a pathetic D to an almost-as-measly D+. So in his 2013 SOTU speech, the President announced a plan to encourage private investment in infrastructure and create a National Infrastructure Bank. The American Society of Civil Engineers' estimate for required investment to get infrastructure up to speed, however, was $3.6 trillion. In January 2015, Obama addressed members of Congress concerning the need to find funding for national infrastructure projects. While Congress agreed the need was there, everyone did the typical by not being able to come to a consensus on where the money would come from. So I know what you're thinking: the Republicans would have a field day arguing that the country should do basically anything but go into more debt, and this kind of overhaul would do just that. The president could propose in response, though, the decreasing of foreign aid to certain countries, whether it be ones that have shown significant development or ones that haven't shown support for the U.S. in recent years. Obama could also go for the gas tax idea this time around. Here's where Americans would have their chance to balk. Yes, it's true. No one wants to pay higher prices for a tank of gas. Americans haven't gotten too comfortable paying that $2 per gallon, though, since the days of a $4 gallon of gas were not long ago. And no one could deny the amount of money just a 50 cent tax would yield to put toward building a new national foundation. Will the proposal make it into the president's Tuesday night speech? Probably not. But the plan is more than just ambitious; it's possible. And Obama wouldn't be the only one to rejoice at the sight of fresh gateways across the country.